held at SeaWorld of Florida. In the second case, West Nile Virus (WNV) killed male orca Taku at SeaWorld of Texas in 2007. Captive environments increase vulnerability to mosquitotransmitted diseases in a variety of ways. Unlike their wild counterparts who are rarely stationary, captive orcas typically spend hours each day (mostly at night) floating motionless (logging) during which time biting mosquitoes access their exposed dorsal surfaces. Mosquitoes are attracted to exhaled carbon dioxide, heat and dark surfaces, all of which are present during logging behavior. Further, captive orcas are often housed in geographic locations receiving high ultraviolet radiation, which acts as an immunosuppressant. Unfortunately, many of these facilities offer the animals little shade protection. Additionally, many captive orcas have broken, ground and bored teeth through which bacteria may enter the bloodstream, thus further compromising their ability to fight various pathogens. Given the often compromised health of captive orcas, and given that mosquito-transmitted viral outbreaks are likely to occur in the future, mosquito-transmitted diseases such as SLEV and WNV remain persistent health risks for captive orcas held in the U.S.
At the time Kanduke died there was uncertainty over the cause. But here is the necropsy which indicated that something unusual had happened, and helped Ventre and Jett find the answer.. 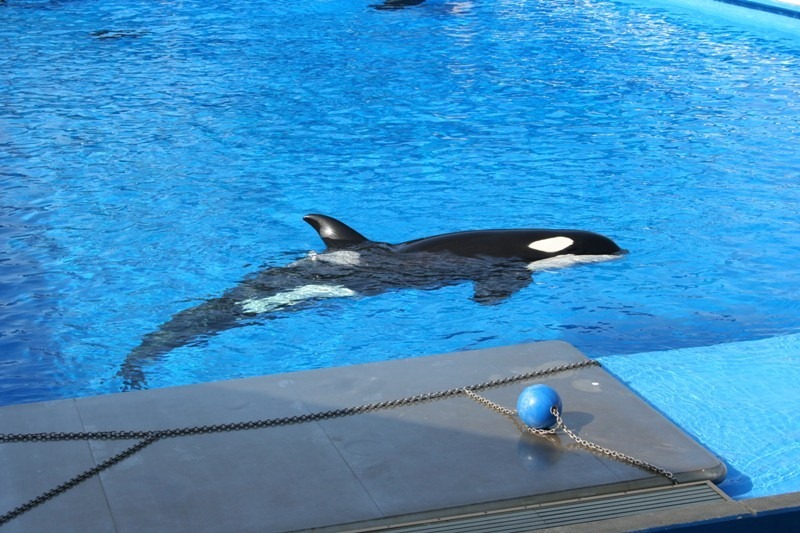 This is an important insight into how captivity affects the lives of killer whales, and what is particularly interesting is how a confluence of captivity-related issues–logging, temperatures, lack of shade, teeth-drilling, etc–combine to create a vector of vulnerability that wild orcas likely do not experience. Which is one more reason that mortality in captivity is greater than mortality in the wild. Very well-done, informative, fact-based, work. ← What Meat Or Animal Substance Won’t The Chinese Plunder For Medicinal Properties? This is a bit flawed – just because there have been no reported cases of mosquito-related deaths in the wild, that doesn’t mean there aren’t any. Although I’d say personally captive marine mammals are probably more likely to have a greater chance of being exposed to harmful mosquitoes, this still isn’t hard proof that they are. Unfortunately two cases just aren’t enough to establish a correlation, the publishers would certainly know that, given their educations. Even though their conclusions are PROBABLY right, this work shouldn’t be flaunted as DEFINITELY right. Mosquitoes are weak fliers and exist inland and near the coast in marshes and inland waterways (not where killer whales live). Orca are constantly on the move with their dorsal surfaces above the water probably less than 5% of their lives. These two facts combine to make it extremely unlikely that a wild whale would get bit by a mosquito (different from the dolphins mentioned in our study that were living in lagoons / intercoastal waterways). If a mosquito were able to fly offshore and chase down a moving orca (which swim faster than mosquitoes fly), it would quickly be washed off. It is the conditions of captivity (only) that allow for exposure risk combined with immunosuppression to kill animals like Kanduke and Taku. We pointed out that the MMIR was misleading and more cases may exist (that are unknown). Finally, this was reviewed by our peers and admitted into the professional scientific literature. Like I already said, I agree completely with everything your study says, but surely it’s more a case of the probability of it happening being low rather than non-existent? I live in Ireland (low mosquito numbers, entire population dies off every winter) so it’s not very likely to ever happen here. It’s also not likely to find Killer Whales in Irish waters BUT – last year a pod spent a few weeks just off our northern coast, they got REALLY close to the shore. So, in theory, could it happen if an orca was close enough to land and in an area with high numbers of mosquitoes? I mean, I agree that it probably would never happen and I don’t mean to seem like I’m trying to discredit your study, I’m just saying I don’t like to state things with such certainty (maybe it’s because I’m working in Statistical Psychology, where we don’t like to EVER agree that something is 100% or 0%). Please don’t take anything I’ve said the wrong way, I’m just pedantic that way, I really do respect the work you’ve done. If WNV and SLEV showed up in autopsy reports and in the case of Kanduke, was listed as the cause of death, where do you suggest they got it from given the limited range of captive orcas? I should have phrased that better – I’m not trying to imply that they DIDN’T die because of their exposure to disease-carrying mosquitoes, I’m just saying it doesn’t fully prove that wild Killer Whales don’t have any exposure at all. I’m not arguing against this study, I’m just saying we don’t fully know all the details of wild Orca populations. The nature of our case report is to describe that two captive killer whales have died from a constellation of variables that exist only in the condition of captivity (including shallow pools, logging, high UV dosing, and exposure risk). As far as I know, and based upon our research, I’m unaware of any other peer reviewed orca studies that provide such a holistic description of orca confinement and how these conditions lead to early morbidity and mortality. Thus, we do now know that two killer whales have died young (at 14 & 25) from mosquito borne viral disease associated with captivity (and a better idea of why other cetaceans die in captivity). And, conversely, NO known (to science) wild orca deaths have occurred from mosquito bites. We welcome another study to look at the issue.